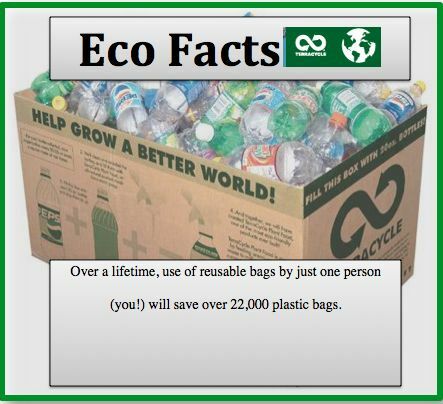 TerraCycle Rocks Eco Facts on Pinterest! Pinterest is a great collection of information and ideas and we can easily fill hours searching and pinning, but we had to pause when we found TerraCycle’s page and all of their great boards. There is a lot of information and we love their eco facts – we love them so much that we wanted to share these 5 eco facts that will blow your mind. 5 Eco Facts That Will Blow Your Mind! Thanks to their light weight, plastic bags are the most likely to fly away from landfills, settling instead in trees, storm drains, beaches, and the ocean. The feature that makes a single-use plastic bag convenient – it’s lightweight construction – also makes it so much more of a hazard. Wind can easily lift a disposable plastic bag and carry it away to be deposited in a tree or river where it will pose harm and be a nuisance. Even when single-use bags are not purposefully tossed aside as litter, even when they are placed in a recycling bin or a trash can (which still isn’t the best way to dispose of plastic bags, but ultimately is better than intentionally littering) all is takes is a moderate breeze to carry the bag off. An estimated one million birds and 100,000 turtles and other sea animals die of starvation every year after ingesting discarded plastic bags that block their digestive tracks. Protect these animals and their homes. This is a staggering number, and what makes this tidbit so much worse is that these deaths are completely unnecessary. If disposable plastic bags were properly disposed of, or if shoppers switched to reusable grocery bags this litter would not pose the harm it does to animals and their habitats. Over a lifetime, use of reusable bags by just one person (you!) will save over 22,000 plastic bags. At first glance this number may seem like a lot, but when you think about how many disposable plastic bags you end up using each and every time you go to the store you can see how things really add up. Reusable shopping bags are a great alternative that do away with the need for disposable plastic bags and are proven to reduce single-use plastic bag consumption and litter. See what cities across the world have bag bans, bag fees, or have tried and failed to implement a bag ban HERE on our Bag Ban Map. According to the Wall Street Journal, only 1% of plastic bags are recycled worldwide while the rest are left to live on indefinitely in landfills or worse… in the environment. Recycling is the only responsible manner to deal with single-use plastic bags since these bags do not break down safely. Throwing the bags in a landfill or worse yet, tossing them out as litter, does not solve the plastic bag problem, it makes it worse. About 80 percent of what Americans throw away is recyclable yet the recycling rate is just 33 percent. Recycling has come a long way and is much more common now than it has ever been thanks largely to education and outreach programs. While it is nice to see recycling rates increase the time it has taken for recycling to be adopted as much as it has is an indicator that recycling is not a viable solution on its own. Simply by switching out disposable products with reusable you can cut down on the amount of items that need to be recycled and there will be less to throw in the bin. Take some time to check out TerraCycle’s Pinterest page and browse through the eco fact page in particular. There is a lot of information that will help put environmental issues into perspective and while you are there, you can follow along with our boards as well and join in our group board and Share Your Posts-Pins-and Products!